need mic suspension that fits on Sony mic clamp: suggestions? I need a good mic mount for my shotgun mic (a Rode NTG-1), but I'm limited because I really don't want to make my EX-1 set-up any 'taller'. As it is, with either one or both of my RF receivers sitting on the hot shoe, I can't actually zip up my camera case completely... it's o.k., but I certainly can't go any higher. And I don't want to take things off and put them back on again when I put my camera away or take it out again. Did I miss some posts? Are there other options available to me? If not, is this a good mount? This is a good mount for what you want to do. Rode make great kit. I do believe I've seen some American product that is similar to this Rode - a quick search on here or a friendly post from someone your side of the pond should nail it. 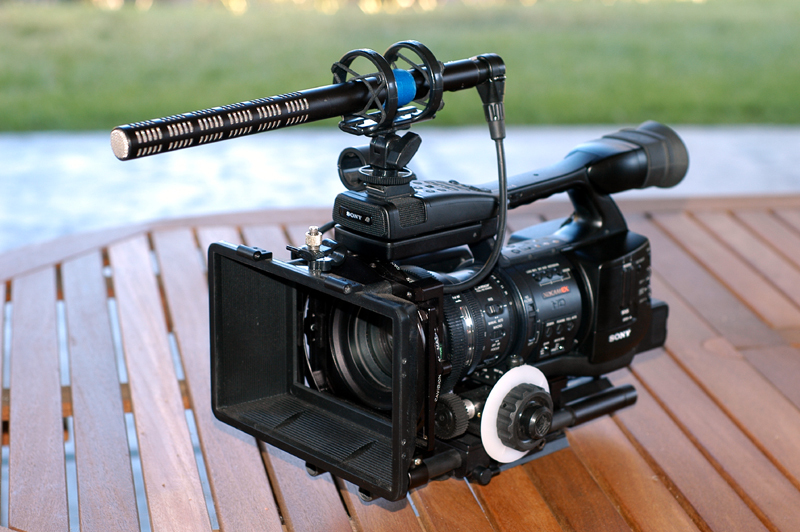 I use the shoe mount version of that same shockmount on my EX1 with my Sennheiser 66. Works fine but it won't fit in the case with it on (Kata CC-10A). I slip it off the shoe and place next to camera in bag. No biggy. invaluable stuff. Thank you all. I'll email the different manufacturers just to confirm questions re mic height, etc. just goes to show that you can ask a question about one thing, and get answers for questions you didn't even think to ask. It looks and works well, and when I place it in the bag I just slip the mount out of the cold shoe and lay it beside the camera (I don't even disconnect mic cables). It adds a few seconds putting it in and taking it out, but I could think of no other solutions that would be better. How do you think the K-Tech shock mount compares to the Rode SM3? (The Rode looks like it would be quite a bit lower). Ronn, I use this same shoe mount on my EX3. Take a closer look and you will see that it comes apart with two screws, such that you can eliminate the middle piece. That lowers the height by more than half, provided you don't need the tilt "thingy". I have also opted for the DM-Accessories EX3 compatible mic mount as replacement for the stock Sony "flimsy thingy" which I removed as soon as the EX3 came out of the box. Cheers! Perhaps I'm just a self-conscious male, but I despise the "droop" that I have seen with that type of shockmount. I want my shotgun to point straight forward without sagging. The K-Tek is firm and does a nice job of keeping it straight. I have a little tip regarding your shock mount (it looks like Røde SM3), I just discovered something when answering Malcolm's question. If you don't need that "knee" on that shock mount and want to reduce the height, you can remove that knee segment from the shock mount assembly and drop the height of the shock mount by 1 1/4" / 30mm. My SM3 didn't include instructions or any paperwork that said this would work, but it looks like it was designed to work that way. Last edited by Jeff DeMaagd; October 28th, 2008 at 12:37 PM. If you don't need that "knee" on that shock mount and want to reduce the height, you can remove that knee segment from the shock mount assembly and drop the height of the shock mount by 1 1/4" / 30mm. . I don't like that knee segment anyway. It's useful if you need to position the mic, but there is no space for that on a camcorder. The K-Tek suggested by Ted looks sturdy as the typical Sennheiser shockmounts pop their rubber bands just when you don't want them to. How do the K-Tek bands fit if you mount them arching downward? I like the idea of shaving a few inches off the height. There is a LightWave minimount, although that sort of build comes at a higher price.